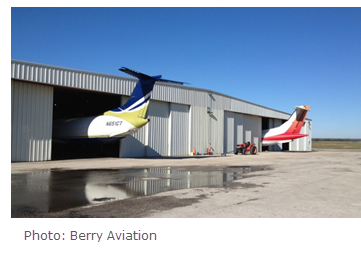 ​​​​SAN MARCOS, CALDWELL COUNTY – Berry Aviation​ Inc. will expand its operations at San Marcos Regional Airport with the signing of a 40-year ground lease and plans to construct a more than 31,000-sf facility. The new facility, 50 miles northeast of Austin, will house Berry's maintenance and supply-chain headquarters, and will include a 20,000-sf maintenance hangar, machine shop, non-destructive testing lab, state-of-the-art parts retrieval system and more than 10,000 sf of office space. The approximately $3.2 million investment will allow Berry to better accommodate their growing airline fleet and staff. The airport is home to the Central Texas Wing of the Commemorative Air Force, housing a museum as well as vintage aircraft. The company is staying because of the growth along the I-35 corridor.